Last month, I woke up early before work to go for a run on the treadmill. I started off by running a few sprints and then all of a sudden—SMACK! I lost my balance and hit my head right in the middle of the belt. Fortunately, I did not lose consciousness and thought I had escaped with only some minor cuts. After washing up, I settled down to work from home, but quickly realized I was having trouble concentrating. I decided to go to urgent care to be evaluated for a concussion, but as I got into my car and put the keys in the ignition, it wouldn’t start! In hindsight, this was a blessing, as I probably shouldn’t have been driving concussed, but in the moment I was incredibly frustrated that my car had quit working at the time I needed it the most. After weighing my options, I settled on taking a Lyft to urgent care. I’ve been reflecting on the ways we travel to and from our medical appointments. Each year, 3.6 million Americans miss doctor appointments due to a lack of reliable transportation. It’s even been called “one of medicine’s biggest problems.” Although lack of transportation can affect all people, this barrier is greatest for patients with limited resources, such as Medicaid beneficiaries. 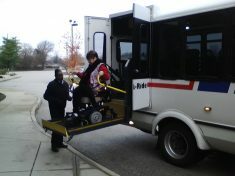 Medicaid beneficiaries are eligible for the non-emergent medical transportation benefit, which allows them to receive transportation—like a van service—to and from medical services like mental health counseling sessions, substance abuse treatment, dialysis, physical therapy, and visits to specialists. However, across the country, Medicaid beneficiaries report challenges accessing quality NEMT services and regularly struggle to make appointments, are treated with disrespect by drivers and customer service staff, are abandoned at medical offices, and are picked up several hours late for appointments. Difficulties in accessing medical care are often even more pronounced in rural communities due to a lack of mass transit options and distance to health-related services. We’ve found that in Fort Morgan, one of the communities where we work, that not many people are able to take advantage of the NEMT benefit, and that booking can be very difficult. This difficulty of booking may be exacerbated by the fact that more than 38% of people living in Fort Morgan speak a language other than English at home, which is nearly twice the national average. Given the challenges with NEMT, Center for Health Progress is helping to facilitate the People-Centered Transportation Coalition, which aims to advance advocacy and policy to improve the NEMT benefit in Colorado in a way that ensures equitable access. The Coalition is currently working with the Colorado Department of Health Care Policy and Financing to provide input on the Department’s NEMT request for proposals, looking into the feasibility of on-demand services like Uber and Lyft, and gathering comments about NEMT. All Coloradans need to have reliable transportation to and from their medical appointments. I’m thankful to have had the option to take Lyft when I needed it, but we must do more to ensure that all our neighbors have access to transportation.